Landing a digital marketing job is one of the most direct ways for tech newcomers to start working in the industry. That’s partly because you can learn a lot of the skills you need for entry-level marketing jobs once you’re actually on the job. 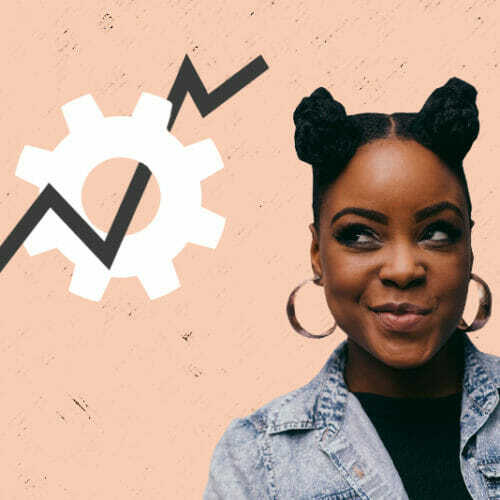 In this article, I’ll break down exactly what it means to be a digital marketer and what types of digital marketing jobs are available to you if you’re just starting out. What Does it Look Like to Get Started in Digital Marketing? 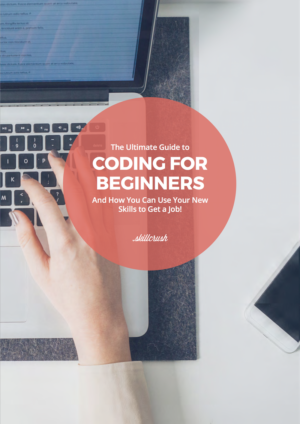 I’ve done marketing for startups for over five years now, but when I first broke into tech, it was through the world of code. After realizing my liberal arts degrees had made me a writer but hadn’t prepared me for the job market, I wanted hard skills that employers would actually pay me for. So, I did some googling and signed up for the Skillcrush Web Developer Blueprint, where I learned the HTML and CSS chops I needed to build basic websites. After finishing, I worked as a freelance web developer. The thing is, coding may have introduced me to tech, but I didn’t stick with the developer life for long. A few months into freelancing, a tech startup hired me to run their blog for ten hours a week. Within months, I was working full-time as a content marketer, managing a content team, making more money than I ever had before, and getting paid to write—all without leaving the fast-paced tech scene I’d come to love. Tech companies need digital marketers. Even with all the technical talent in the world, startups can’t grow without people who can communicate their products to customers. Marketing jobs make it possible for you to work in tech even if you don’t want to be a designer or developer. 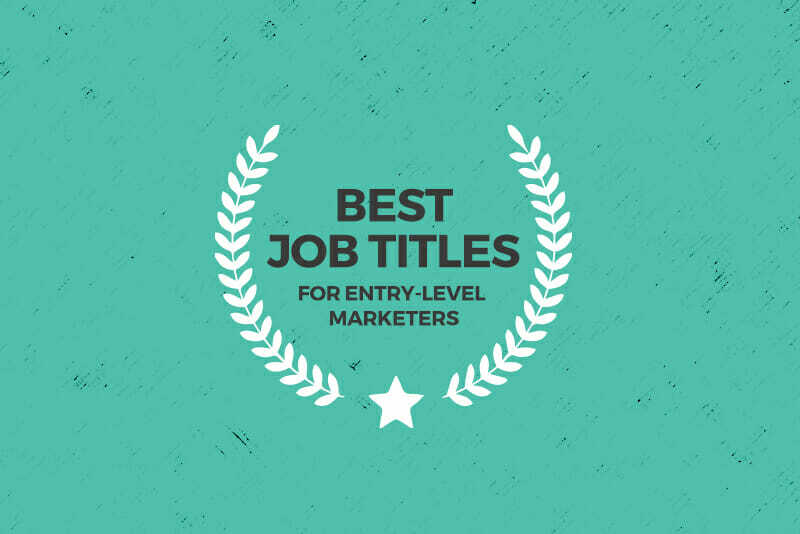 There are plenty of entry-level marketing jobs that make the tech world accessible to newcomers. And, just like with other tech roles, many digital marketing jobs allow you to work from home and earn a higher salary than you might in other junior positions. To explore even more job boards, check out these 25 sites for finding roles in the tech space. But, What Exactly is Digital Marketing? Let’s back up. What is digital marketing, and how is it different than regular marketing? Marketing means selling or promoting a product or service. Digital marketing is just that, but on a digital device, like a computer or smartphone. When you work in digital marketing, instead of relying on subway ads or billboards, you attract and retain customers using emails, blog posts, text messages, Internet ads, and more. Digital marketing isn’t necessarily online, since radio, television, and phone marketing technically involve a digital device, too. That said, in this post, I’m focusing on digital marketing that happens using the Internet and that tech companies are likely to hire you to do. To be a successful digital marketer, it’s crucial that you understand the journey people take to become customers. How do they first hear about the product? What factors lead them to trust the company? At what point (and why) do they actually make a purchase? And, what happens after someone becomes a paying customer—how do you keep them? Most importantly, which part of that journey will you influence? In the industry, this journey is called the marketing funnel. If you end up working at a smaller company, you might be responsible for the entire funnel or customer journey. 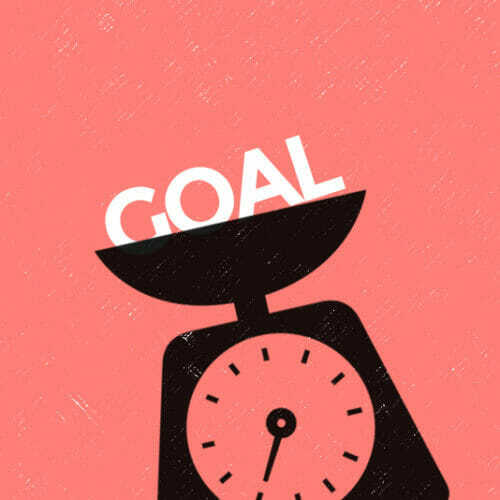 At a larger company, however, you could focus on just one “slice.” For example, a content marketer might focus on the top of the funnel, hoping to convince new potential customers to share their email addresses. A paid ads specialist, however, could focus on the bottom of the funnel, where they convince customers to make a purchase. That’s why it’s so important that, as a digital marketer, you know how to track the success of your projects. Employers want to know you’ll spend their marketing dollars wisely, and that means spending time on channels you know are working and improving (or ditching) the ones that are underperforming. 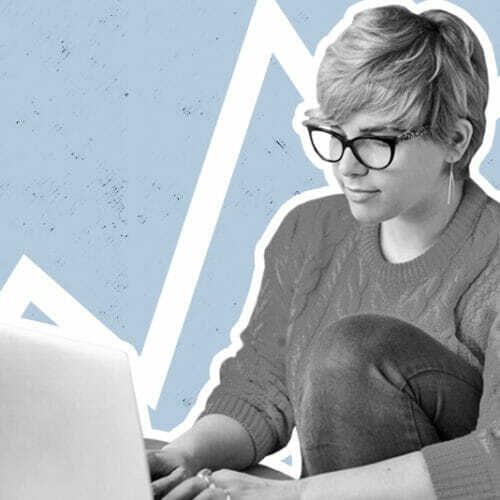 Marketing is a creative field, but you’ll still need technical chops to track and analyze data. If this sounds like a lot to master, we can help. 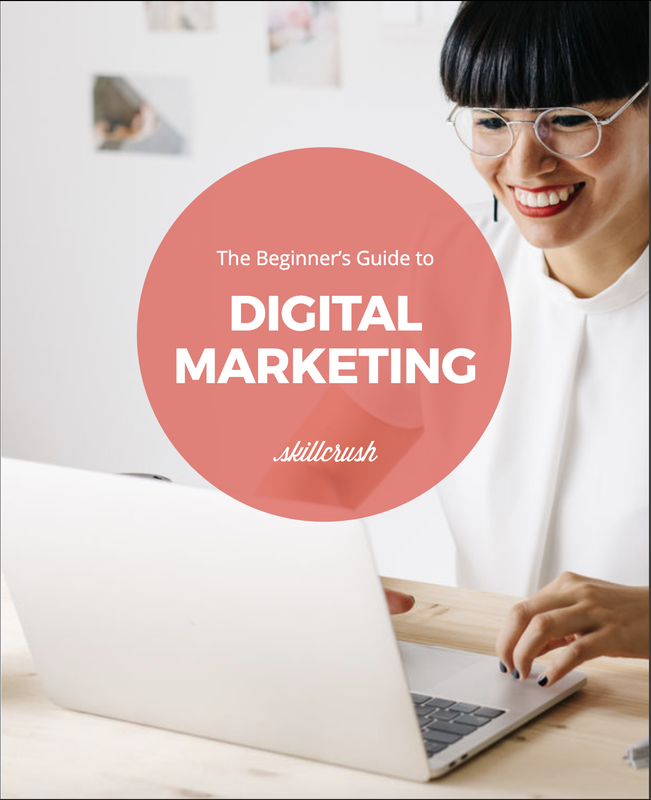 In the Skillcrush Digital Marketing Blueprint, we break down these concepts step-by-step, plus get into the nitty-gritty details you’ll need to learn to get hired and succeed in your job. Someone with the job title “Digital Marketer” is typically a digital marketing generalist. Most often, you’ll find this role at a smaller startup, or at least at a company that’s just beginning to build a marketing team. You’ll need to be able to switch gears quickly and make daily decisions about the best way to spend your time. Depending on your company, you could do everything from writing email newsletters to proposing partnerships with sponsors to managing paid ads. “Growth Marketer” is a related job title, though growth marketing roles are typically heavier on optimization and technical “hacks” that help companies grow faster without doing more. Content marketing jobs tend to attract writers and editors, but there’s more to it than that. Remember the customer journey? Content marketers, also known as content strategists, typically focus on the top of the funnel (TOFU), or “inbound marketing.” A content strategist’s goal is to attract new inbound users and bring in new leads—or, in other words, get their email addresses. 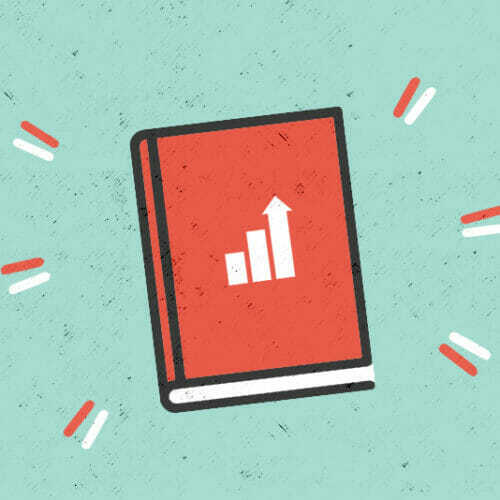 Content marketers typically do this with content like blog posts, downloadable whitepapers or ebooks, and multimedia content like videos and infographics. Content strategists are skilled at writing and editing, and may also need to be well-versed in SEO. At smaller companies, content strategists are sometimes in charge of social media, too. The job titles “Content Producer” and “Content Creator” are related, but typically mean you’ll focus on actually making the content versus setting the strategy. First off, what’s SEO again? SEO, or search engine optimization, means setting up your site in a way that makes it easy for people to find you when they search for your business or related terms. SEO specialists need to know how to conduct keyword research and turn what they discover into an SEO strategy. They typically need to be comfortable using tracking tools like Google Analytics and Google Search Console, which they’ll be working with daily. “SEO Writer,” is a related job title, but it usually indicates that you’ll report to a content manager or SEO specialist and focus on actually creating content that follows SEO guidelines (versus doing the research from scratch). Social media managers, sometimes also called social media coordinators, do a lot more than check Facebook. In this role, you’ll set a strategy for growing and engaging a social media following, usually across multiple platforms. You’ll work closely with designers, content creators, and ad managers to share and promote content that attracts new users and helps customers trust (and maybe even get obsessed with) a brand. The job title “Community Manager” is related. A community manager moderates a community, like a company Facebook group or user forum. The difference is that community managers are more concerned with keeping customers happy than with attracting new users. Like digital marketers, marketing managers could work on a wide variety of marketing tasks, depending on the company. Sometimes, a job titled “Marketing Manager” is the same thing as a “Digital Marketer” role. That being said, marketing managers are less likely to work on content and social media, and more likely to work on marketing campaigns farther down the funnel. Instead of publishing blog posts and working on SEO strategies, they’ll send sales emails, manage ad campaigns, or work with partners on marketing projects. Search: These are ads that appear in search engines, like at the top of Google after you type in a search term. Social: These are ads that appear on social platforms, such as Facebook and Instagram. Paid marketing managers often work with large budgets, sometimes into the millions of dollars per year, depending on the company’s “ad spend.” Their day-to-day involves working with designers and content teams to get the images and copy used in ads, analyzing ad performance, and making tweaks to improve them. Partnership marketers make and manage strategic partnerships…but what does that mean, exactly? They can do a wide variety of work and might spend their day meeting with big names in the industry, talking about the company’s product at a conference, or even speaking with podcasters about ad slots. Just like with more technical roles, there are plenty of remote or work-from-home digital marketing jobs. And, since you can learn a lot of key marketing skills on the job, digital marketing can be a great option for anyone looking to change careers without going back to school or moving to a big city. And for the skills you do need before applying? We’re here to help. The Skillcrush Digital Marketer Blueprint is a comprehensive online program designed to take you from zero to landing your first job in marketing. Learn more and download a syllabus. May I just say what a comfort to uncover someone who really understands what they’re discussing on the internet. You certainly know how to bring an issue to light and make it important. More and more people really need to check this out and understand this side of your story. I can’t believe you are not more popular because you definitely possess the gift. One thing I’d really like to say is always that before buying more personal computer memory, look at the machine into which it would be installed. Should the machine is running Windows XP, for instance, the actual memory threshold is 3.25GB. Adding above this would basically constitute a new waste. Be sure that one’s motherboard can handle this upgrade amount, as well. Good blog post. Having read this I thought it was rather enlightening. I appreciate you taking the time and effort to put this article together. I once again find myself personally spending a significant amount of time both reading and posting comments. But so what, it was still worthwhile! One thing I want to say is that before buying more computer system memory, look into the machine within which it could well be installed. In the event the machine can be running Windows XP, for instance, a memory threshold is 3.25GB. Adding greater than this would purely constitute any waste. Make certain that one’s motherboard can handle this upgrade quantity, as well. Thanks for your blog post. Thank you, I love your blog.